Several years ago I devised a set of rules to allow you to model a football match and even a World Cup competition. The rules are so simple you can play a full World Cup in one lesson, and they're accessible enough to appeal to primary as well as secondary schools. If football, why not cricket? The shorter form known as Twenty20 seems ideal, so here's a game that, like Twenty20 itself, is both accessible and quick to play. It also meets my requirements for a mathematical game - it must be fun to play, involve opportunity for some valid mathematics (plenty of arithmetic, data-handling, and probability), require decisions to be made, and use readily available materials (just a single die, numbered 1 to 6). 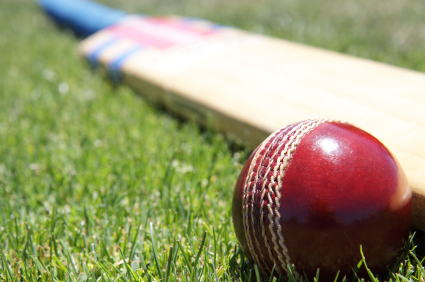 Cricket fans will know that in each match the team batting first will bat for a maximum of twenty six-ball overs, though should it lose all ten wickets any remaining overs are forfeited. Its opponents then bat for a maximum of twenty overs in turn, attempting to beat this score. Generally speaking, a batting team will hope to get off to a decent start and accelerate more and more as the innings builds to a climax. Usually this acceleration is feasible only if sufficient wickets have been conserved in the earlier stages. Should things go wrong early on there may be a need for a mid-innings retrenchment - on the other hand, at the end of the innings runs are far more important than wickets, and later on a team will take risks it wouldn't dream of taking earlier. 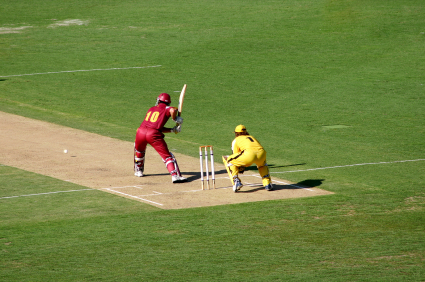 In a cricket game many overs will result in between one and six runs being scored. This makes it very simple to use a conventional six-faced die as a means of generating the runs scored over by over. We must also involve the bowling side as well, so for each over, both players roll the die. The batting player scores the number of runs s/he rolls, and if the bowling player rolls a 6 then the batting team loses one of its ten wickets. These two simple rules allow an innings to be played through in just a few minutes. However, it gives a pretty anaemic game, as neither the number of runs nor the number of wickets is sufficiently large to make things at all interesting. Worse still, it's purely mechanical. I want any simulation to require pupils to make decisions (so does Attainment Target 1, for that matter). The batting side should be able to decide when to play conservatively, scoring fairly slowly but with a relatively low risk of losing wickets. At other times a more aggressive mode may be needed, and the batsmen will take more chances in an attempt to score extra runs. This is easily incorporated. We'll call the original style of play Style 1, but we'll introduce the possibility of Style 2: at any point the batting player may decide to accelerate, so s/he rolls the die not once but twice and adds their scores to get the total score for the over. Of course, more aggressive batting means more likelihood of losing a wicket, so the bowling player also rolls twice for that over. If the bowler rolls a 6 on either throw a wicket is lost (and two 6s mean that two wickets fall). And since Twenty20 cricket often throws caution to the wind, there's Style 3 as well, where the batting player chooses to throw the die three times to get the total number of runs in the over. Likewise, the bowler throws three times, and each 6 means the fall of another wicket. Now if you try this, you'll find that it's much better. However, it's still not 100% satisfactory. It's too easy for the batting side to use the super-attacking Style 3 throughout. They're unlikely to lose all their wickets and may well post a score of over 200 (in a game of Twenty20 cricket a total of below 100 is very poor, 150 might be reasonable, and the occasional 200+ marks an excellent total). But a good simulation allows you to build in additional features to model the real situation, and in any cricket team the strongest batsmen are highest in the batting order and the later batsmen are weaker - less likely to score runs and more likely to lose their wickets. So to reflect the weakness of the lower batsmen we'll incorporate one more rule. 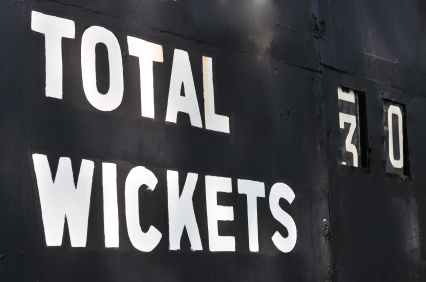 Once the batting side has lost five wickets, further wickets fall whenever the bowling team rolls either a 5 or a 6. Play continues, until either twenty overs have been played, or the batting side has lost all ten wickets. The players now exchange roles and the ex-bowling side now has twenty overs to try and overhaul the total made by the first team. Particularly if you're batting second you're going to have to evaluate the position each over, and I think the game is worth playing in its own right. I imagine these simple rules will satisfy most people, but there's plenty of scope for taking things further. It is possible for a team to score no runs in an over - maybe you could reassign one of the numbers on the batting teams' dice to correspond to this, or say, for example, that if the bowler rolls a 1 then the batting team scores zero for that over, regardless of what they have rolled. You might like to use a slightly less blunt instrument for distinguishing between batsmen - perhaps wickets should fall when the bowler rolls a 6 for the top four wickets, then on a 5 or 6 for the next three, and on a 4, 5 or 6 for the final three. And wickets fall most easily in the last couple of overs, so you could introduce a modification to take care of that. We have batting Styles 1 to 3; is it worth trying a Style 4? And should the play be directed entirely by the decisions of the batting side, or should the bowling team have an input into the tactics? Rich Tasks. Probability. Biology. Real world. Engineering. Mathematical modelling. Maths Supporting SET. Calculus generally. Physics. Addition & subtraction.